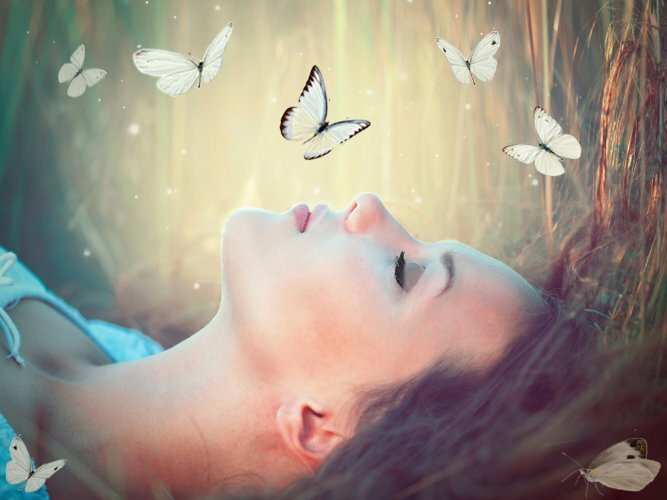 A recent blog commenter asked the question: Can we be contacted from the fairy realm through our dreams? Do Fairies Communicate Through Dreams? Mr. E: The answer is yes, fairies do contact people through their dreams. To be clear, magic is everywhere, especially in nature. The white butterfly, in particular, has to do with purity and metamorphosis because a butterfly wasn’t always a butterfly. In other words, the dream could symbolize moving into something pure. NL: Let’s talk about these archetypes, symbols that you see repeatedly. Can symbols like white butterflies appear to people repeatedly to let them know that there is a connection? Mr. E: Yes, the fae could easily send these symbols to a person because they are always connected to the elements of nature. NL: So, what she is experiencing is valid? NL: What other symbols would they use? Would the symbols be something that is meaningful or relevant to the person? Mr. E: Yes, the symbols a being would choose would have to have some meaning to the person they are connecting with. I could rattle off a thousand different symbols, but it wouldn’t do any good because it has to be meaningful to the person they are connecting with. Fairies usually pick an animal like an elk, or an element like fire, water, air, or earth. Someone might see something like waves, or another aspect of nature. There are definitely different ways fairies can send you information. Sometimes they will send you the same word that you might repeatedly see in your dreams, in your life, in a book, or a sign. But the symbols aren’t random; it depends on the person. They could choose a zillion different symbols depending on who they were speaking to. NL: It is not surprising to see a butterfly used as a symbol by those in the fairy realm, is it? Mr. E: No, a butterfly would be a common symbol, but fairies aren’t the only ones who will send you messages, you can pick up things from the spirit world as well. Even a human, once they have passed, can send you messages like that. Your dead aunt, for example, could tell you something in your dreams. She could either appear herself or send you a message like a butterfly, something that would be personal to you and remind you of her. NL: Do some beings connect more through dreams than others? If they want to communicate with a human, they will try through dreams first. It’s the easiest way to connect with humans–more than any other method I know of–because humans are more susceptible and open when asleep. NL: Would you agree that even though connecting through dreams may be the easiest method, it may not be the most effective method? Meditation can provide a much better connection. Mr. E: If you can learn to meditate you can get a better connection, but dreams are the easiest way to establish a connection for beginners. NL: What does it look like on the other side of the veil when these beings contact you in dreams? Do they have to be nearby? Mr. E: Yes, they always have to be nearby. You couldn’t have Mr. E talk to someone in Florida, although I would love to visit Florida. They have to come to visit you and be in the same room. NL: What can people do to work on connecting with the fairy realm through their dreams? Mr. E: My suggestion is that you announce before you go to bed that you want to connect with the fairy realm. So I would say, put your intention in your mind before you go to sleep, and watch your dreams. See what dreams you can remember, and keep working on it that way. NL: Would you recommend drinking an herbal tea? Some herbs are recommended to help amplify a connection. Mr. E: I would not recommend drinking any herbs at night, because you might sleep too well and not remember your dreams. So, I would suggest you do not do that but keep at it. You may not be contacted in the first week or the first month. That’s what people sometimes don’t get. They try it once and say it didn’t work, and give up. You have to keep trying, don’t be quick to write off the process as a failure because it didn’t work the first time. Communication isn’t necessarily a slam dunk; it’s something you need to train yourself for. There isn’t an instant way to create a connection. Persistence is key here, as it is with any situation. This post was written in response to a question written in the comment section of one of our blog posts. Because we are so familiar with Mr. E from interviewing him over the years, we sometimes forget what needs to be answered. What questions do you have for us and Mr. E? Write any questions you may have in the comment section below, and you may see it answered in a future blog post! I have one question and I’m wondering if Mr. E can answer it. I watched a YouTube video where New Ageism is demonized. Magic is part of it, but we know for a fact that it’s not evil, but the intent behind the person who is using it. The question is, why is new ageism considered demonic? Maybe someone who’s human can answer my question. Wow, sorry about the nightmares, that sounds awful! I really love this article and website! It’s such a coincidence too as recently I had the most awe inspiring dream about Elves! It’s also great because I have for a while now actually come to the realization that I am an incarnated Elf. I would really love to get the views of Mr E and Natalie about this. Is there a way I can email or tell you please?